I feel no small reluctance in venturing to give to the public a work of the character of that indicated by the title-page to the present volume; for, difficult as it must always be to render satisfactorily into one's own tongue the writings of the bards of other lands, the responsibility assumed by the translator is immeasurably increased when he attempts to transfer the thoughts of those great men, who have lived for all the world and for all ages, from the language in which they were originally clothed, to one to which they may as yet have been strangers. Preeminently is this the case with Goethe, the most masterly of all the master minds of modern times, whose name is already inscribed on the tablets of immortality, and whose fame already extends over the earth, although as yet only in its infancy. Scarcely have two decades passed away since he ceased to dwell among men, yet he now stands before us, not as a mere individual, like those whom the world is wont to call great, but as a type, as an emblem—the recognised emblem and representative of the human mind in its present stage of culture and advancement. 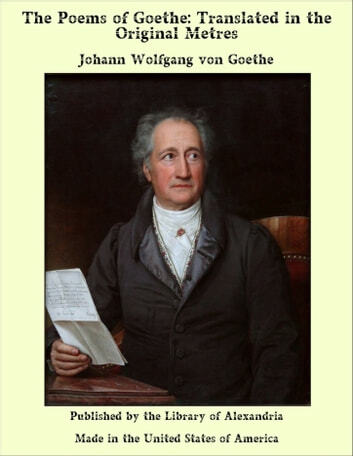 Among the infinitely varied effusions of Goethe's pen, perhaps there are none which are of as general interest as his Poems, which breathe the very spirit of Nature, and embody the real music of the feelings. In Germany, they are universally known, and are considered as the most delightful of his works. Yet in this country, this kindred country, sprung from the same stem, and so strongly resembling her sister in so many points, they are nearly unknown. Almost the only poetical work of the greatest Poet that the world has seen for ages, that is really and generally read in England, is Faust, the translations of which are almost endless; while no single person has as yet appeared to attempt to give, in an English dress, in any collective or systematic manner, those smaller productions of the genius of Goethe which it is the object of the present volume to lay before the reader, whose indulgence is requested for its many imperfections. In addition to the beauty of the language in which the Poet has given utterance to his thoughts, there is a depth of meaning in those thoughts which is not easily discoverable at first sight, and the translator incurs great risk of overlooking it, and of giving a prosaic effect to that which in the original contains the very essence of poetry. It is probably this difficulty that has deterred others from undertaking the task I have set myself, and in which I do not pretend to do more than attempt to give an idea of the minstrelsy of one so unrivalled, by as truthful an interpretation of it as lies in my power.